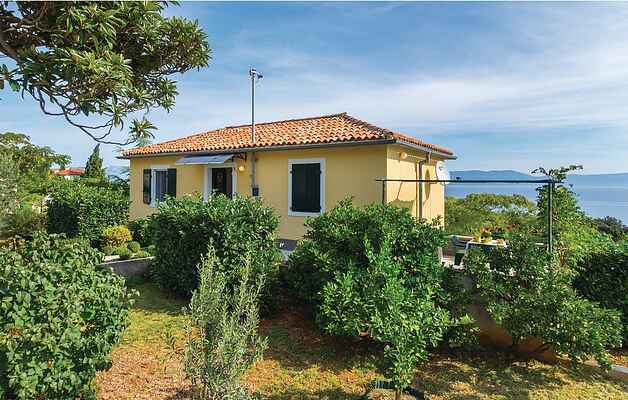 Spend a holiday in this attractive and partially renovated holiday house with a fantastic panorama view on the sea and the surrounding islands, which is located in the small town of Ravni. The place is especially known as a destination for divers and surfers because of its crystal clear sea water, beautiful beaches and untouched nature. The domicile surrounds a landscaped garden with Mediterranean plants, which makes it ideal for a relaxing holiday. By the sea, there is a small restaurant where you can taste the local dishes in the afternoon. We recommend an excursion to the nearby village of Skitača, the highest point in the region, with a magnificent panorama view on the Kvarner bay and the old town of Labin.